The salmon fishing has been slow mainly because of weather conditions and not much interest because the salmon fishing has been slow the last few years this time of year but the few diehards that are going out are finding a few immature Chinook mostly trolling flashers and spoons or artificial squid at depths of 120’ to 160’. The Quartermaster Harbor and Clay banks areas should be your best bet this time of year. The crabbing remains fair with a mixture of Dungeness and BIG Rock crab in the catches. The Squid fishing has slowed a little but should get better once the water clears up some in the next few days. Report submitted by Point Defiance Marina. For more information contact: Art Tachell, Boathouse Marina Technician, 253.591.5325 art@tacomaparks.comwww.pointdefiancemarina.com. The cover image of this week’s fishing reports was also submitted by the Point Defiance Marina and features Gene Anderson with a 3 and 8 pound coho caught trolling herring. The Washington Department of Fish and Wildlife (WDFW) predicts “Excellent” prospects for Chum, and “Fair” prospects for Coho during November in Marine Area 12. The Washington Department of Fish and Wildlife (WDFW) predicts “Excellent” prospects for Chum, and “Fair” prospects for Coho during November in Marine Area 13. Arlen Thompson of Othello with his morning Macks. We have made it through our first big cold snap of the winter and now we are getting our first significant snow fall, but our early winter pattern of trolling the Barrens and the Trench for Mackinaw on Lake Chelan continues hot. Also continuing hot is bank fishing and trolling for planter Rainbow Trout on Roses Lake. We troll for these mostly eating sized Lakers from 220 to 245 feet deep. Fish within 3 to 5 feet of the bottom and keep your speed around .8 to 1.3 mph. Glow in the dark Smile Blades from Mack’s Lure continue to be the go to attractor here on Lake Chelan. Put those in front of a 4 inch needlefish squid rig by Silver Horde, bait them with a piece of Northern Pikeminnow and scent everything with Pautzke’s Krill Juice to keep yourself consistently into the fish. These fish are completely jammed full of Mysis shrimp. This in turn makes the meat especially delectable. While we find those mysids in our Lakers all year, this late fall / early winter time really concentrates that feed in the lower basin to fatten up our fish. 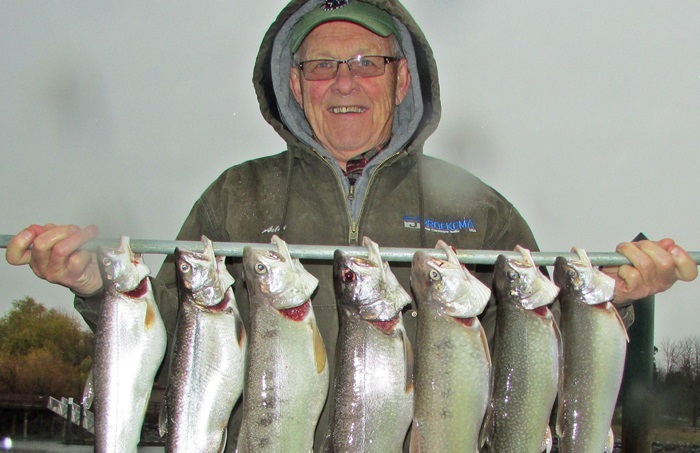 Rainbow trout on Roses Lake can be caught by a variety of methods. Catch them from shoreline locations with Pautzke’s Firebait in American Wildfire using a 30” leader on a slip sinker rig. You can also catch them trolling using Mack’s Lure Mini Cha Cha Squidders behind a Mack’s Lure 0000 Double D Dodger. Bait those mini cha cha’s with a piece of worm or a small nugget of Pautzke’s Fire Bait. WDFW planted approximately 16,000 fish that were 2.4 fish to the pound. Those are about 9” fish. So far, Roses hasn’t frozen over and shore anglers are limiting in less than an hour. The recent windstorm will force you to park up on the street until the fallen trees are cleared from the WDFW access drive. By the way, access to Omak Lake is limited to car top boats due to low water making the rough launch unuseable. Your fishing tip of the week is to take a page out of the tournament anglers strategy book and prepare plans A, B, C and maybe even D to make efficient use of your precious “on the water” time. This could mean rigging trolling gear and lining up lures so that if plan A’s presentation you can work through your progressions without having to search and then tie knots with chilly fingers. If you are going to switch from still fishing to casting, have those rigs prepared and ready to put into action. This requires thinking ahead and preparing at home. Keeping your presentation in a prime location in an attractive way will make you more successful. It’s only logical. I will dispense with normal format for my first post Veteran’s Day Report to share my thoughts and feelings before moving on in future reports. I believe the best thing that we can do to honor our war dead is live well and joyously. However, I think it is occasionally necessary to reflect and appreciate their sacrifices. My friend, Terry Gilden was killed in the Beirut Embassy bombing of 1983. The mission there was to bring the bloody civil war in Lebanon to an end. In 1993, my friend, Randy Shugart was killed by militants of a Somalian warlord. The mission there was to clear the way for food supplies to reach hundreds of thousands of starving civilians in rural Somalia. While critical thinking is necessary and skepticism can be useful, make no mistake. Flawed as we might be, we are the good guys because men like my friends answered the call and do their best to implement our national will. George Orwell said it best: “People sleep peaceably in their beds at night only because rough men stand ready to do violence on their behalf.” Just reflect for a moment about the lifestyle we enjoy and give thanks for these men. For more info call Anton & Sandra Jones of Darrell & Dad’s Family Guide Service;darrellanddads.com; antonj@aol.com or call (509)687-0709 or toll free at (866)360-1523. The cover image of this week’s reports was also contributed by Jones. I awoke this morning to volleys of shotguns going off. Yes the duck hunting is in full swing. So far the walk-in lakes are still clear of ice and are producing some good shooting. With the cold weather coming the smaller lakes could soon be froze over. Consider using a guide working out of Mardon resort. I have a trail camera in my backyard and am daily finding deer have passed by in the dark hours of the day. Fishermen are finding walleye still biting on the mail part of Potholes. The walk-in lakes are still turning out nice trout. My son Matt walked into lakes just to look at them and found several very large trout milling close to shore and in 2 feet of water swimming over the now submerged vegetation. I am sworn to secrecy but there are year-round lakes below the dam. Salmon fishing was VERY SLOW for anglers in East Sooke. Anglers are now concentrating their effort s inside the bay. There were a few winter springs caught, just not too many and most are too small to keep. G-force spoons were the most productive lure. However, plastic baits have been popular as well, especially in UV and/or glow patterns. The Glow/Green Stripe hootchy has been effective for springs this past week. Spoons, such as the G-Force and Skinny G, in the Bon Chovy or Irish Cream colours were effective. For flashers, the Lemon Lime and the Purple Onion have been good. Four halibut were brought into the marina on the weekend. Salmon fishing was SLOW this past week. Some winter springs have been caught and they were too small for retention. Most salmon were caught when fishing with lures right on the bottom (60-110 ft) on the Flats and by the Gap. The fish were hitting needlefish spoon and squirts. G-force and Skinny G spoons in No Bananas and Outfitter colours worked just fine. Coho Killers in Gold Nugget and Green Splatterback have been pretty productive too. The best flasher has been the Gibbs Lemon Lime and the Bon Chovy. Salmon fishing was SLOW this past week. Winter springs up to 7 lbs were being caught inside the bay, along with lots of little ones. The anglers are fishing right on the bottom and often bouncing the downrigger balls on the bottom. There are a lot of shaker chinooks all around this area. Anchovy was the most productive bait when trolling for springs with Glow Green and Bloody Nose being top choices in teaser heads Small spoons, such as the G-Force, Coyote and Gypsy, in the glow and/or any bright colours were effective. Flashers that remain popular include Glow green, Lemon-Lime and Purple Onion. Salmon fishing was SLOW near Sidney. There is a lot of bait around Coal Island and Sidney Spit, so there should be some fish there. Most of the winter springs are short of the minimum size for retention. Most anglers are fishing using anchovies in Bloody Nose and UV Green teaser heads. Coho Killer spoons have also been working well, especially in double glow and Gold Nugget. Prawning has been quite slow in Saanich Inlet. The salmon fishing was VERY SLOW this past week. There are lots of undersize springs off Sooke right now and few keepers. The 3.5-4” G-Force spoons, as well as hoochies, are the top choices for Sooke anglers. G-Force spoons in Outfitters, Irish Cream and No Bananas have been very popular. Hoochies in White Glow, Army Truck and Tiger Prawn have been catching their fair number of fish. The most popular flashers recently have been the Ok’i Betsey, the Gibbs Outfitter and the Madi. Fishing for salmon was VERY SLOW along the waterfront but a bit better out at Constance and Border Banks. Winter springs up to 5 lbs were caught this week on the bank. There were also a lot of smaller ones on the bank. Anchovies, spoons and squirts were successful in getting hook ups. Chartreuse and Purple Haze have been the most popular colors for teaser heads. Good choices in plastic baits are the Electric Chair, Purple Haze and Glow white. Gypsy, AP Needlefish, G Force and Coyote spoons in green, moon glow and silver colours have also been good. The Purple Onion and Bon Chovy flashers have been popular recently. Recent rains caused the river to blow out peaking last Tuesday. The water level at the lake is over 1.8 meters and it’s over 1.5 meters near Duncan. Chum fishing in the lower river has been good. At the top end, egg patterns are the flies to use now. Effective until December 31, 2015 the daily limit for chum salmon is two (2) adults in the following portion of the Cowichan River: Downstream from the Mile 66 Trestle Bridge to the Highway No. 1 Bridge (Silver Bridge). Anglers are reminded that coho retention (both adults and jacks) remains closed at this time. The Cowichan River is Open to Fly Fishing Only from the Weir in Cowichan Lake downstream to the Mile 66 Trestle (CNR Trestle). Fishing is GOOD on most lakes. Many of the lakes are undergoing the fall turnover. Wild rainbows and cutthroats over 50 cm must be released in Cowichan Lake. Bass fishing is VERY SLOW. Soft plastics rigged Carolina style are working well and crank baits too. Soft plastics rigged “Carolina Style “is also a good choice when fishing drop offs and docks. The most productive colors in 4” Yum baits are Smoke or Pumpkinseed. Langford Lake, Shawnigan Lake, Prospect Lake and Elk and Beaver Lakes are the best local bass lakes. St. Mary’s Lake on Salt Spring Island is also a great lake for bass fishing.